XBM Yosho published the article Pauper ban list draft! Welcome to the "Unofficial Official" paper Pauper and paper Peasant banned card list thread. Their has been several discussions regarding what is legal within paper Pauper and or paper Peasant. The hope of this thread is to clarify this for the entire community. All of the below is fact, what you and your playgroup decide to do with this information is up to you. 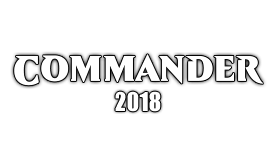 It is true that "Magic The Gathering Online: Pauper" has a ban list, that is because it is a sanctioned format and that sub-forum can be located HERE. This sub-forum however is for "Casual" paper Pauper and paper Peasant which are not sanctioned. The very essence of Casual is no ban list yet people seem to forget what governing forum they are in when they argue the point of a ban list or any restrictions. Paper Pauper and paper Peasant have no official ban list, zero, none. Any ban list or restrictions enforced by anyone are not official. Some cards may be super broken or "unfair" but as it is a Casual format, unsanctioned by DCI or Wizards, you can play with whatever you want. For reference here is the Magic The Gathering Online: Pauper ban list and additional rules. Remember, these are not applicable to the Casual paper format unless your play group decides to use them. Common promo cards are only legal if the card has been printed before at the common rarity in a set or product. Paper Peasant doesn't have an online version but it does have its own unofficial ban and restricted list. All of that is below and once again it is not official, so within the Casual format you can use anything; it just depends on what your play group allows. For reference here is the Magic The Gathering Peasant ban list and additional rules. Remember, these are not official and are only in use if your play group decides to use them. All silver-bordered and gold-bordered commons and uncommons are banned. HERE is a link to the paper Peasant Magic website, you can read up more on the format there as it will be more detailed then what it written here. Rarity debate in reference to whether C1 (common) and U1 (uncommon) cards are legal to play with. Different playgroups have different rules when dealing with these cards from such sets as "The Dark", "Homelands", ect. The debate begins with whether or not these cards are actually common or uncommon and I will explain why. C1 is a rarity abbreviation for a card appearing 1 time on a "common" print sheet and C2 is a rarity abbreviation for a card appearing 2 times on a "common" print sheet. The same can be said for U1 and U2 as-well. In those days they had no specific "rare" rarity even though some cards were more scarce then others. If you apply today's rarity structure to the old sets this is where the confusion sets in. Normally when playing paper Pauper or paper Peasant the rule of once a common, always a common applies, however when dealing with the older sets which had a completely different rarity structure than the newer sets you start running into problems. Since a C1 card was printed on the common sheet some consider it to be common regardless of how many times it was printed, others who go by today's rarity structure refer to it as an uncommon card because of how many times it was printed on the common sheet. This is also true for U1 cards as they were printed on the uncommon sheets some consider these uncommon regardless of how many times it was printed, others who go by today's rarity structure refer to it as rare because of how many times it was printed on the uncommon sheet. Now for something even more confusing, in the case of sets such as "Alliances" we have C1 common cards that have two different artworks but are both considered C1 common cards. However, they may be considered C2 common cards by some because even though they had two different artworks they are the same card printed twice. Hopefully this clears up any confusion, whether or not a C1 card is usable in paper Pauper or U1 cards are usable in paper Peasant are going to be fully dependent on your playgroup and determine. Coming from a Casual format sense though if you want to play with them you can because as stated several times, they're no ban lists or restrictions. It is as you see it. Except for Arabian Nights, Antiquities, The Dark, Fallen Empires, Chronicles, Homelands, & Alliances, all other boosters prior to the introduction of mythic rares (even Alpha, if my source is correct) contained 15 cards at a rarity breakdown of 11-3-1. (11 commons, 3 uncommons, & 1 rare per booster) Most of those exceptions, however, only contained 8 cards and had a rarity breakdown of 6-2. (6 commons & 2 uncommons per booster) Alliances had a breakdown of 8-3-1, while Chronicles had a breakdown of 9-3. Legends had a more normal breakdown of 11-3-1. The terms U2, U3, C5 and such represent which sheet the cards were printed on (uncommon or common) and how many appeared on the sheet. (2, 3, or 5, respectively) For all of these sets, both the common and uncommon sheets contained 121 cards each, likely organized into 11 columns and 11 rows. With this as a basis for rarity, whether a card was printed on a specific card sheet or another doesn't matter. Only the cards rarity (as a percentage) affects its status as common, uncommon, or rare. It's important to remember that C1 only means 'printed on the common sheet 1 time'. For sets with a breakdown of 6-2, (6 cards from the common sheet and 2 from the uncommon sheet) C1 cards had the same rarity as U3 cards, (4.96%) making them uncommons. Most other breakdowns put C1 cards at a lower rarity, making those cards commons. It seems that Gatherer lists these as commons because they were printed on the 'common' sheet of the print-run, even though they have the same rarity as U3 cards. Though more common than C1s from sets with 6-2 rarity breakdowns, these still fall within the 'uncommon' rarity. Legends used a modern rarity breakdown, so its C1 cards meet the 9.09% common rarity threshold. Though each version (different art) is technically uncommon for collecting purposes, these 'cards' are considered to be C2, C3, or C4 depending on how many versions there are, so are common for rarity purposes. I've included these here because it may be easier to evaluate the MTGO metagame and see what it's missing than to do so with the paper metagame. 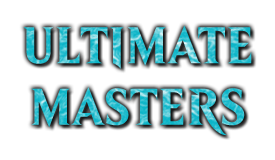 MTGO has none of the cards released prior to Mirage, except for those available through the Masters Editions. Though playing with paper cards, it seems odd to restrict myself to commons only printed on paper. I see no reason to exclude cards virtually downshifted in rarity, as the pauper format, to me, is all about using cards that have been common in limited formats, and the masters editions WERE created, in part, for limited. There isn't really anything interesting here, as far as I can tell. Maybe Icequake or Death Spark? Because there's disagreement on the rarity of some cards in these early sets, it's important to understand these differences to determine which are legal for us. Anyway, just thought I'd share my research and thoughts regarding the pauper rarity debate. Posted in: Pauper ban list draft! What exactly is Pauper Burn? In essence it is exactly the same thing as the regular good old Burn we have always loved but the only exception being you can only use common cards. The nice thing about Burn is that most of the effective cards are all common, so this makes adapting this archtype to Pauper very easy! This primer will be discussing the archtype as it is related to the paper form of the game not the online version. 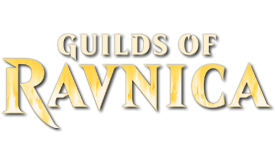 Some cards and strategies are transferable from Magic Online to paper and vice versus, but the general outline will be focused on paper Magic. The main idea is to very play cheap burn spells such as Lightning Bolt and Searing Blaze to widdle your opponent down to very low life and once you have enough lands on the field you can use things like Fireblast and Shard Volley to destroy your own lands to deal lethal damage! You will have some support cards such as Needle Drop to generate card draw and dare I call him support but Keldon Marauders can come into and out of play to burn and prevent any pesky critters from touching you. 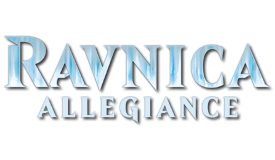 All of the sideboards in each decklist within Pauper have been designed for a broad meta, it is completely up to the builder to decide what works and what does not work within each sideboard as this can serve as a starting point. Simian Spirit Guide This card is fantastic if you choose to run a pump based burn deck focusing around Kiln Fiend. Use him for free mana to cast spells to proc your Kiln Fiend and get your Reckless Charge working. 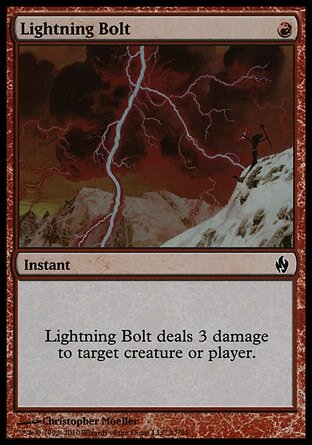 Lightning Bolt This is the best single mana burn spell in the game. Shard Volley When it is time to deal lethal, use this paired with Fireblast and finish them off. Cast this with one mana then sacrifice that same mana and deal your 3 damage. Lava Spike Direct damage to your opponents face, yes it only targets players but if you target a creature you aren't playing Burn correctly. Needle Drop I find this card invaluable, 10 out of 10 times you have dealt damage to the player before you get a chance to use this card so this should be a no brainer as it also gives you draw. Rift Bolt Play this for the suspend cost only and the next turn they lose 3 life, really no negative here minus the short delay. Lava Dart Normally this isn't a good burn card, but if you pair it with Kiln Fiend it provides double pump! 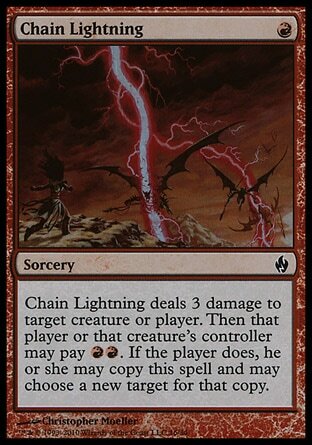 Chain Lightning A lot of people love this card, and it is priced well for a reason but since it is a sorcery I don't find much use for it in my own testing. I kill no faster with it nor any slower so why spend the money if you don't have to? You can just use Lava Spike for a much cheaper card. Crimson Wisps If you are running Kiln Fiend or Keldon Marauders this card might just help you out! It also has card draw! Electrickery This card is iffy for me, I tend to not like it as much because I play my Burn very self sacrifice like, so I never have the mana to cast it effectively, it just doesn't burn as fast as other cards can. Spark Elemental Some people prefer to this guy but honestly he has more negatives then positives. After turn 2 he becomes almost completely useless. He can't block, and his damage can be stopped even with his trample ability so that one mana can be spent elsewhere. However if you choose to run a creature burn deck then slapping a Reckless Charge on him could make him a little more threatening. Goblin Fireslinger A nice ping creature if you choose to go more creature heavy. Pillar of Flame If you fear creatures in your meta, this is a choice card. Way better then just a simple Shock, it exiles those pesky critters so they have no chance to come back! Firebolt Simple 2 damage, nothing special but it does have a flashback cost. The opponent should be dead though before you get a chance to flashback. Mogg Fanatic He swings for 1 and can self sacrifice himself to block and deal 2 damage to a creature, not bad but certainly not in the top burn card list. Fireblast Amazing damage for a small cost. On turn 4 after you have cast what you needed, finish them with this and call it a day. Kiln Fiend Amazing if you pair him with Reckless Charge, he beats a ridiculous amount of face! Keldon Marauders Excellent burn on the way in and out, as-well as a attacker and blocker. Searing Blaze I can't speak highly enough about this card. For only 2 mana you can blow down a creature and damage the player for 3? Are you serious!? Include = YES. Flame Rift I use this card, though it has severe drawbacks. If you have 5 life and they have 4, use it. I would rather go to a draw with them then let them win. Incinerate Pretty solid burn spell with the added benefit of stopping regeneration. Searing Spear Strictly worse then Incinerate, honestly not much reason to use this card. Volcanic Hammer Same as above, nothing to shake your fist at. Brimstone Volley Way to expensive and it once again relies on creature death to be effective. Just not a good card to get that fast kill that a Burn deck needs. Thunderclap Honestly this card just doesn't cut it. Why would you want to burn a creature? You need to beat face as fast as possible and this just doesn't under any circumstances help that especially when you have Searing Blaze. Staggershock If this is all you have, ok use it but the math just doesn't work on this card, three mana for 4 damage is HORRIBLE. Reckless Charge Amazing, it needs to be paired with Kiln Fiend though for maximum face beatage. Smash to Smithereens Strictly a sideboard card to remove artifacts. Pyroblast Going up against blue? Include this! Relic of Progenitus Strictly a sideboard card to remove any annoying graveyards. Faithless Looting Straight forward card draw, slow though. Molten Rain Normally I don't care what mana they have in Pauper, so this is a sideboard card and just a maybe overall. Forgotten Cave If you fancy a cycle land, this is your choice. The primary focus of this deck is simple, burn as fast as you possibly can. It doesn't utilize single creature pump like Kiln Fiend decks do, their isn't really any fancy draw spells, just plain old burn. The sideboard allows me to deal with artifacts, any annoying blue counters, some dedicated pinging and some graveyard hate with additional card draw. If left uninterrupted this deck can produce 25 damage on turn 3, if a single spell is stopped it can still do 21-22 damage on turn 3. This deck uses the Kiln Fiend casting method, burn away everything in your path and push through with your fiend. You also have the option of casting your Reckless Charge onto your Keldon Marauders and let him swing, and if he dies that's great because he still does damage on the way out. I would give this match up a 70/30 if not better because with the right cards (IE: not Shock) we can easily outrace these decks since we are capable of going lethal on turn 3. 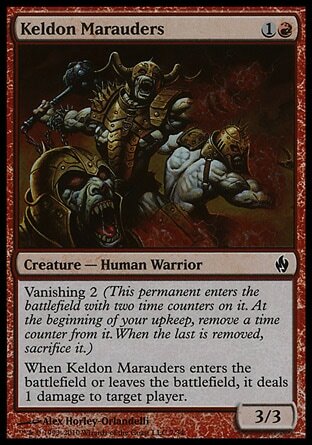 Since we are racing the opponents deck to deal lethal damage and we have really little to no creatures we are trading blow for blow BUT a creature like Keldon Marauders can change the balance since he deals damage on the way in and way out in addition to blocking or attacking. Outside of Mono-U you should have little to no problem dealing with a control based deck, but that is why we sideboard in Pryoblast. Most of the time the other colors rely on you having creatures but shutting down spells is a bit harder, not impossible mind you but much much harder. Combo decks such as Affinity can spur off lethal damage by turn 4, a well equipped Burn deck can do lethal damage by turn 3, so in this capacity a combo match up is slightly in our favor. However if facing a combo deck like Soul Sisters then your Burn deck is vastly outclassed and the chances of winning are very slim. Most other combo decks can't really lock down a Burn deck so you should have favorable match ups in this department aside from what has been noted. What exactly is Peasant Burn? In essence it is exactly the same thing as the regular good old Burn we have always loved but the only exception being you can only use up to five uncommon cards and the rest need to be common cards. The nice thing about Burn is that most of the effective cards are all common and their really is only a small select few that are worth adding from the uncommon card pool, so this makes adapting this archtype to Peasant very easy! This primer will be discussing the archtype as it is related to the paper form of the game not the online version. Some cards and strategies are transferable from Magic Online to paper and vice versus, but the general outline will be focused on paper Magic. 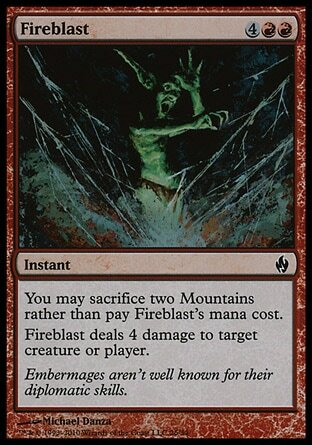 The main idea is to very play cheap burn spells such as Lightning Bolt or cheap creatures like Hellspark Elemental to widdle your opponent down to very low life and once you have enough lands on the field (just like with Pauper) you can use things like Fireblast and Shard Volley to destroy your own lands to deal lethal damage! You will have some support cards such as Needle Drop and Browbeat to generate card draw and dare I call him support but Keldon Marauders can come into and out of play to burn and prevent any pesky critters from touching you. All of the sideboards in each decklist within Peasant have been designed for a broad meta, it is completely up to the builder to decide what works and what does not work within each sideboard as this can serve as a starting point. 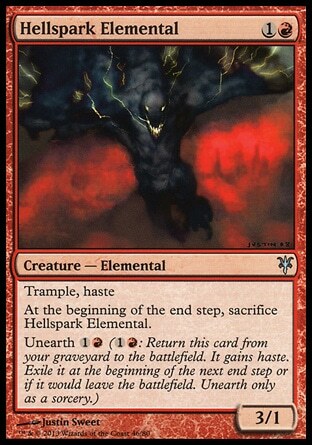 Hellspark Elemental Much better then his little brother Spark Elemental because he can come back if you need him. If you want to run a creature burn deck in Peasant he should be considered closely. Ball Lightning This card is EXTREMELY iffy. This creature falls under the old rarity debate of whether or not U1 (uncommon) is in fact an uncommon. The current rarity structure would have it at a rare, but SOME playgroups may allow for this card to be used so you will need to check with your playgroup. If they allow it then you should substitute Hellspark Elemental for this creature immediately. 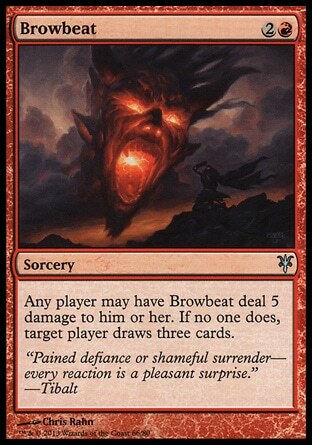 Browbeat If you expect longer than usual burn games, this can be nice card draw or also a fantastic burn. Barbarian Ring Ok I suppose, though the mana could be spent on more powerful burns, it also causes problems with Fireblast and Shard Volley. The primary focus of this deck is simple, burn as fast as you possibly can. It doesn't utilize single creature pump like Kiln Fiend decks do, it uses a nice draw spell which can also be converted into a burn if your opponent dares. The sideboard allows me to deal with artifacts, any annoying blue counters, some dedicated pinging and some graveyard hate with additional card draw. If left uninterrupted this deck can produce 25 damage on turn 3, if a single spell is stopped it can still do 21-22 damage on turn 3. This deck uses the Kiln Fiend casting method, burn away everything in your path and push through with your fiend. You also have the option of casting your Reckless Charge onto your already hasted and trampled Hellspark Elemental to walk through anything annoying. What exactly is Pauper Soldiers? In essence it is exactly the same thing as regular Soldiers but the only exception being you can only use common cards. The Soldier archtype has been around for quite awhile and has evolved over the years into a semi-serious deck that deserves respect. Even though it is not currently competitive like its White Weenie counterpart it is still very fun to play in casual and a very easy beginner deck or just something to have plain straight forward fun with. This primer will be discussing the archtype as it is related to the paper form of the game not the online version. Some cards and strategies are transferable from Magic Online to paper and vice versus, but the general outline will be focused on paper Magic. The main idea is to play cheap, fast and usually first strike creatures such as Porcelain Legionnaire and Mosquito Guard to create a strong early board presence and then eventually lay down your pumps such as Veteran Armorsmith and Veteran Swordsmith to work down your opponent. You will need to use support cards such as Unmake or Glorious Charge to help out so that your creatures can punch through to give you that victory since the soldier archtype is inherently weaker then others. Mosquito Guard This little guy should be a BnB creature for your soldier decks. One mana for a 1/1 first striker with the ability to pump another creature is pretty nice. 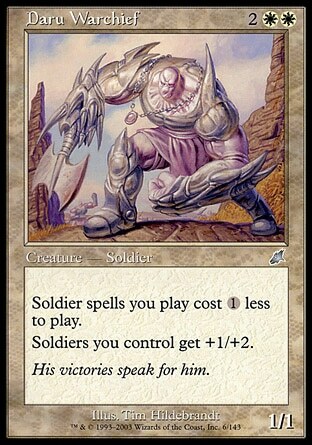 Soltari Foot Soldier Very effective one drop, the evasion on this guy is amazing in this format. Pair him with Soltari Trooper for maximum results. Deftblade Elite One of the all time best soldier creatures printed, provoke a lord to his death or simply pick the field off. Pair this guy up with Catapult Squad in Peasant and you have a force to be reckoned with. Serra Zealot Strictly worse than Mosquito Guard, obviously if it is a choice between the two you would run the latter, but if you run them together this creature is very nice. Doomed Traveler A solid one drop because it replaces itself, the only draw back being you will lose any pump from your lords unless using Veteran Armorer. Gideon's Lawkeeper Identical to Goldmeadow Harrier, use IF NOT running Kithkins. Goldmeadow Harrier Identical to Gideon's Lawkeeper, use IF running Kithkins. Icatian Javelineers Normally this guy is amazing, but he gets over shadowed by all of the first strike options within the Pauper soldier card pool. You could pair him with Kor Skyfisher as you would in White Weenie but that is dedicating roughly eight cards to one strategy. Auriok Glaivemaster If you are running an equipment deck, you need this creature as it is your BnB Pauper equipment creature. Ardent Recruit If you choose to run equipment this guy is decent though he lacks any combat ability such as first strike or shadow. Kitesail Apprentice If you are running an equipment deck, you need this creature as it is your BnB Pauper equipment creature. War Falcon Though not a soldier itself, this little bird is a nice 2/1 body with evasion if run in the correct deck. Worth looking into simply for the evasion. Honorable Scout Strictly a sideboard creature for obvious reasons. Akrasan Squire Honestly one of the worst soldiers in the Pauper format, and I personally think not good in any capacity. The soldier archtype thrives on swarming, and swarming quickly so he is quite counter intuitive. Soltari Trooper An amazing card, fantastic evasion and pump from attacking. 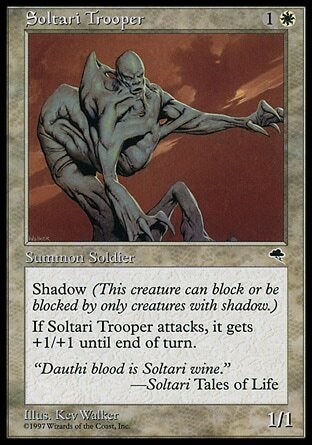 I highly suggest the use of this card and its little brother Soltari Foot Soldier. Veteran Armorsmith Strictly better then the below since we are running tribal, this is your basic BnB pump lord. Veteran Armorer Normally this guy is better then the above, but since we are running a tribal archtype, the above is better do to his 2/3 body. Loyal Cathar A great returning creature, the best part is he returns as a soldier so your pump still works! Crossbow Infantry A slightly more expensive but more effective version of Icatian Javelineers. Ballyrush Banneret If you are playing this guy, I would suggest he be included in a Peasant form of this deck as he can get things out faster such as Daru Warchief. Usually Pauper is fast enough on its own. Benalish Trapper A more expensive but a little more defense body version of Goldmeadow Harrier and Gideon's lawkeeper. Personally I feel the others are more effective. Cenn's Heir If you are running primarily Kithkin this guy should be an auto include, if not he is very mediocre. Expendable Troops A great card if facing down something like Tormented Soul. Auriok Sunchaser An excellent equipment deck creature as it gets a +2+2 and evasion. Sunspear Shikari This creature is completely amazing in an equipment deck. BnB equipment 2 drop creature! Kor Skyfisher Use this if using Icatian Javelineers, normally good in White Weenie it lacks effectiveness in a pure tribal deck. Raise the Alarm The biggest problem with this card is it only drops basic no ability creatures. Great to block but useless otherwise unless your idea is to mass pump something like Crusader of Odric in Peasant. Veteran Swordsmith Your BnB offensive pump lord. Ballynock Cohort A 3/3 for three with first strike, pretty straight forward and effective. Elder Cathar This is a good reason to not run Kithkin, if you run soldiers and humans, you get stronger. Kithkin Zephyrnaut Very solid creature if you run a Kithkin based deck. Combat Medic If playing a defensive game against Burn, this card can save your life in tribal. Basilica Guards A nice blocker and the extort mechanic is good, but he gets overshadowed easily. Ballynock Trapper If you choose to go with Kithkins I highly advise this card as it can just annoy the hell out of your opponent and make it much easier to swing for lethal. Unmake The best creature removal for Pauper soldiers, it is cast at instant speed, and completely removes the creature without leaving a card behind like Journey to Nowhere. Lotus Petal You need this card for Turbo-Soldiers! Oblivion Ring If you need anything to be removed from the game, this is the ticket right here! Prismatic Strands THE protection card for soldiers. Bonesplitter The best pump card in the Pauper format outside of Affinities own Cranial Plating. Unified Strike Only worthwhile if you are running a soldier version of White Weenie. Journey to Nowhere If you cannot afford Unmake for some reason, this is a good backup. Dust to Dust Excellent artifact hate! 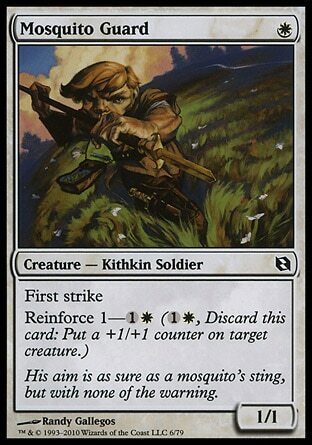 Serrated Arrows A great card, simply an all star and even better when you use Kor Skyfisher on it! Adventuring Gear This card is absolutely amazing when running fetch lands in an equipment deck! Guardians' Pledge Slightly better then Glorious Charge but at a more expensive casting cost. Vulshok Morningstar If you want additional pump, this is a good choice. Holy Light Mass creature damage to clear the field if needed. Glorious Charge Not the greatest pump, but it does work on all of your creatures so attacking in a swarm can be quite deadly. Standard Bearer and it becomes a god send. Bone Saw Free, effective simple pump card for your equipment deck. Repel the Darkness With this card you get to tap some annoying creatures for an attack and also card draw which is pretty rare in a White Weenie deck More of a sideboard option card then main deck though. Origin Spellbomb Along with Repel the Darkness this card also grants card draw, but it also drops a creature. Sunlance Dedicated creature nuke, really just a sideboard option. Flickering Ward Pretty solid protection, and it is movable. Empyrial Armor Pretty nice pump if you can keep the cards in your hand. Disenchant Strictly worse then Oblivion Ring, almost no reason to use this card. Arrest Never use this card, Journey to Nowhere and Unmake are waaaaaay better. Pacifism For the same reason as above never use this card. Secluded Steppe Nice and simple card draw if needed. Sejiri Steppe This card has been seeing more and more play in my meta, the evasion it offers can really make the difference late game with a creature who has a few Bonesplitters attached. Kabira Crossroads Pretty good life gain since soldiers has a lack of it. The main focus of this deck is to pump your first strikers, provoke any problematic creatures and remove any major threat be it creature, enchantment or artifact. If you cannot afford Turbo-Soldiers this is a great option. Pretty straight forward, slap down your creatures and rely on your equipment to activate the abilities. Use your fetch lands to double proc your Adventuring Gear for a deadly strike or massive life gain. This deck doesn't use traditional soldier pump, it instead relies on the reinforce ability, Surge of Thoughtweft, and the combined number of Kithkin to pump up Cenn's Heir. Remove what is in your way and pummel your opponent. 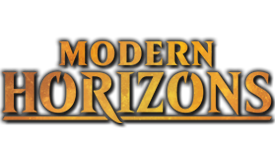 Thin your deck slightly with Squadron Hawk and Secluded Steppe for better draw. The basic idea behind this is to flood the field on turn 2 with several creatures by using Lotus Petal, by turn 2 you should have 3-4 creatures on the field which in most cases is plenty to overwhelm an opponent early game especially because this deck uses first strike and shadow so well. Slap a Bonesplitter on a creature with shadow for free damage or on a first striker to remove any annoying blockers. This deck can have a very strong early game, a well setup mid game but a very very mediocre late game. These are usually always our best match ups. Soldier decks employ very fast creatures, though weaker then most they have great abilities such as first strike or shadow to pummel other aggro critters down to victory. To do well we need to race our opponents within the first 2-3 turns to kill them faster than they can kill us. 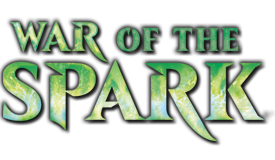 Spot removal will be our best friend in these games to take out key threats so that our creatures handle the lesser guys and push through to victory. The soldier archtype in this format really doesn't have many options unlike White Weenie to be overly competitive to answer certain threats. Soldier decks normally rely on quick creatures to get the job done, take away any of that competitive quickness and you will lose your ability to win. Our only hope is to use protection cards such as Prismatic Strands and hope we aren't forced to discard. The name of the game here is to simply kill them before the combo goes off, if you cannot do lethal damage before Affinity floods the field with free and powerful evasive creatures your going to have an uphill battle. It isn't impossible but since soldiers lack end game punch through power it will be a struggle and you will have to utilize cards such as Dust to Dust to aid your cause. XBM Yosho's Pauper/Peasant White Weenie Primer. What exactly is Peasant Soldiers? Well just as stated above it is the same as regular Soldiers but your deck must be constructed of only common cards, but you are allowed to use up to 5 uncommon cards as-well. When you jump into Peasant Magic you open up a larger selection of cards to use, but you just need to narrow them down to a choice of five cards for your deck. The main idea is exactly the same as the above for the Peasant version of Soldiers, but you get to play creatures such as Daru Warchief as your pump creature over something like Veteran Swordsmith. Your support cards can change with such removal spells as Path to Exile and protective spells like Brave the Elements. The core of the deck will remain almost unchanged though since you are only allowed five uncommons. Alaborn Zealot This creature is the Peasant version of Loyal Sentry, it forces your opponent to consider not attacking. I honestly don't understand the price difference because they are the same thing but that aside I don't really see a reason to not consider this creature. Cenn's Tactician I really like this creature and depending on your strategy in Peasant this may be a solid choice to play both offensive and defensive. Boros Elite A very simplistic 1/1 for 1 mana that can easily become a 3/3 on turn 2. The only drawback being it has no evasion or combat ability such as first strike or shadow. Dryad Militant A strictly better version of Elite Vanguard because of the added graveyard hate. Kor Duelist If you are running Peasant equipment, you may want to consider this creature over some other uncommon equipment cards. Hada Freeblade Normally a fantastic creature outside of the 5 uncommon restriction, in Peasant it flops. Kazandu Blademaster A 2/2 first strike and vigilance creature for only 2 mana? Yes please! 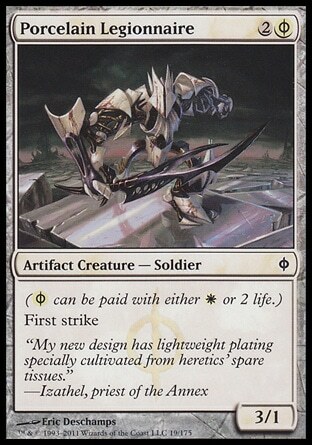 Catapult Squad BnB soldier creature right here, if you run Deftblade Elite you strongly need to consider this creature in your deck as they work together like peas in a pod. Longbow Archer At one time this creature was an auto include, he is still very good and still in consideration because of his reach. Jötun Grunt Strictly a sideboard creature if going against anything that utilizes the graveyard. Crusader of Odric Similar to an Ajani's Pridemate, if you want a big tough creature to scare the crap outa an opponent this will do it! Daru Warchief The best soldier lord in Peasant hands down. Enlistment Officer If playing Peasant Turbo-Soldiers this might be a good choice, more creatures I say! MORE! Rhox Pikemaster If you fancy first strike, this creature is ok, though most soldier creatures either come with it already or something comparable. 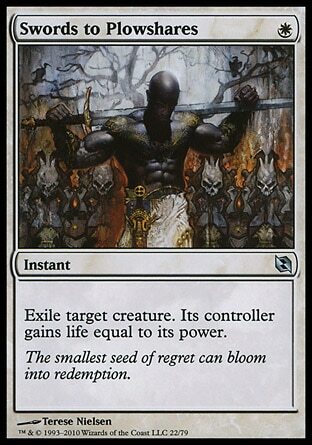 Swords to Plowshares Along with the below, it is the best white removal spell in the game. 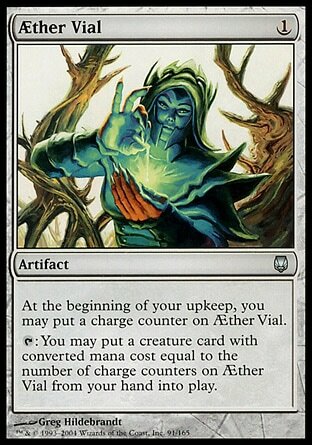 Path to Exile Along with the above, it is the best white removal spell in the game. Brave the Elements You have an army and can deal enough damage to win? Cast this and they can't block you anymore, GG. Skullclamp A nice pump aside from the -1 toughness, worst case scenario you get to draw a card from it. Aether Vial Excellent for Peasant Turbo-Soldiers! Daru Encampment If you fancy a land that pumps soldiers, this is your only choice although I wouldn't really suggest it as card draw or life gain is normally more important. The basic idea behind this is to flood the field on turn 2 with several creatures by using Lotus Petal and Aether Vial, by turn 2 you should have 3-4 creatures on the field which is most cases is plenty to overwhelm an opponent early game especially because this deck uses first strike and shadow so well. By turn 3 you should have emptied your hand and you can slap a Bonesplitter on a creature with shadow for free damage or on a first striker to remove any annoying blockers. I went with Veteran Armorer over Veteran Armorsmith because Ballyrush banneret can make him cheaper while he cannot do that with the latter. This deck can have a very strong early game, a well setup mid game but a very very mediocre late game. The main focus of this deck is to get down your Daru Warchiefs and Veteran Armorsmiths as quickly as possibly. That is why I have outfitted this deck with both Lotus Petal and Ballyrush banneret. Pump, remove and win! If you cannot afford Peasant Turbo-Soldiers this is a great second choice. XBM Yosho published the article The only furry who plays Magic it seems. Posted in: The only furry who plays Magic it seems.